San Giovanni de Laterano or Saint John's in Lateran, Rome, Italy. On my last journey through Rome, I was determined not only to revisit the most celebrated sights like the Vatican, Colosseum, Roman Forum, etc., but also discover hidden treasures throughout the eternal city that I have read about, and that most visitors overlook because they’re off the beaten path. So, I embarked on a research mission to uncover some of these sights of historic and religious significance and plotted them on my Roman crusade to explore these often overlooked and forgotten places. Despite the fact that my camera batteries died during this journey which is the reason for three borrowed and credited images below, I had a fascinating time nonetheless. I invite you to come along on this journey through Rome and I hope you too, discover something new and wondrous for your next trip. Our first stop is San Giovanni in Laterano or Saint John’s in Lateran, which is only a short distance west of the Roman Colosseum. Built atop Mt. Celio, one of Rome’s seven hills, San Giovanni is the first Christian basilica built in the world and the original Papal seat until the 15th century. Consecrated and dedicated to the Savior in A.D. 324, dedications were later added for Saints John the Baptist and John the Evangelist. San Giovanni de Laterano or Saint John's in Lateran interior. San Giovanni Papal Altar - Canopy at top contains relics of Saint John and Saint Paul. Once you're here, you can't help notice the striking resemblance to Saint Peter’s Basilica in the Vatican. From the saintly statuary perched atop the pediment to the interior ornamentation of the nave and Papal altar, I couldn’t help but make comparisons throughout my exploration of this first church of Christianity. Plus, I was astounded by two fascinating discoveries I made during my time there. Inside the canopy of the Papal altar, completed in 1367, are two reliquaries with the heads of Saint Peter and Saint Paul, somewhat gruesome, I admit but nonetheless unexpected. The second is a special set of green doors leading into the basilica. Originally cast of bronze and now oxidized green, these doors once belonged to the Roman Forum's Senate building. During the past, they were moved and replicas inserted in their place. See my picture of the Roman Senate building below. For additional shots of San Giovanni's interior, read my article "Captivated by the Light." Roman Forum Senate Building. Green doors are replicas due to moving of originals to San Giovanni. Saint Simon, one of 12 Apostles lining the nave of San Giovanni de Laterano or Saint John's in Lateran. Moving on from San Giovanni, we cross the street to a very nondescript building that houses one of the most sacred sights of Christians around the world – Scala Santa or the "Holy Stairs." Each year, thousands of Christians make their pilgrimage to this holy set of stairs sanctified by Jesus Christ during the Passion when they were originally located in Pontius Pilate’s palace. When you visit, you'll find some worshipers traverse the steps on their knees while others walk upright, or still yet, remain at the bottom to kneel and pray. Whether your Christian or not, you can’t help but sense the heightened spirituality resounding throughout these hallowed halls and be moved by it, as was the case for me. We change direction and travel east toward the Colosseum – to the Basilica de San Clemente. Dedicated to Saint Clement, the fourth Pope after Saint Peter, the church is an historical chronology on three levels dating back to a first century pagan temple at its lowest depths, up through the fourth century and finally to the 12th century, the point at which you enter the basilica. At the lowest level, you transcend time to the first-century pagan temple and discover the Altar of Mithras. Ascending to the level immediately above, you find a fourth-century basilica containing a nave and ancient frescoes from the eighth century. Finally at ground level, the 12th century, you discover an even more magnificent nave with 15th-century frescoes adoring the walls. If you want to learn more, visit the Basilica de San Clemente website for an incredibly interactive tour through history. Finally, just north of the Colosseum lies San Pietro in Vincoli or Saint Peter in Chains. The basilica's name originates from a relic housed inside the altar that is reputed to contain the actual chains that bound Saint Peter during his trials in Jerusalem. However, it is for another reason I included this historic place on my itinerary. 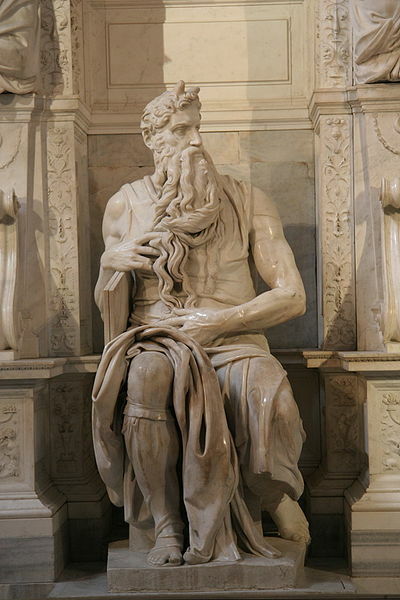 Saint Peter in Chains, built in 432-440, is also home to one of the most extraordinary masterpieces ever completed by Michelangelo – his famous statue Moses. Originally intended for Pope Julius II's ill-fated tomb inside St. Peter's Basilica, the statue ended up here because of Pope's untimely death which resulted in the tomb's abandonment. Did you know that Moses' face is believed to be a self-portrait of the master sculptor himself? Imagine two millenniums of history can be found throughout Rome and all you need to do is to possess the curiosity and passion to discover ancient temples, forgotten civilizations, lost art and architecture, treasures of antiquity and most notably, some of the holiest places in the world. Then, venture OFF the beaten path and go forth on a crusade all your own. [This is starting to sound like an Indiana Jones movie.] You'll find these places void of the throngs of tourists, so you won’t be overwhelmed by crowds at all. Love this! I don't think I've been to the first one. Rome has so much more to offer than the usual must-see list. Thank you so much for stopping by and sharing your experience and I agree that Rome offers infinite possibilites. Hi Jeff, enjoyed your article and your photos are absolutely beautiful! Thank you so much for stopping by and for your compliments. Truly, this was a fascinating journey for me on so many levels and I needed to capture my experience here. Glad you enjoyed it too! Beautiful photos, I didn't visit these sites, but will do next time. :) Thank you for sharing. Thank you so much for your kind words my friend. These sites were truly fascinating and I am very fortunate to have had the time on my last visit. Thx for visiting and sharing your thoughts!! Jeff, I come to your website whenever the travel bug bites or I miss Rome too much (I travelled there this summer and fell irrevocably in love with it), but no matter how often I come here, I always seem to discover something new. 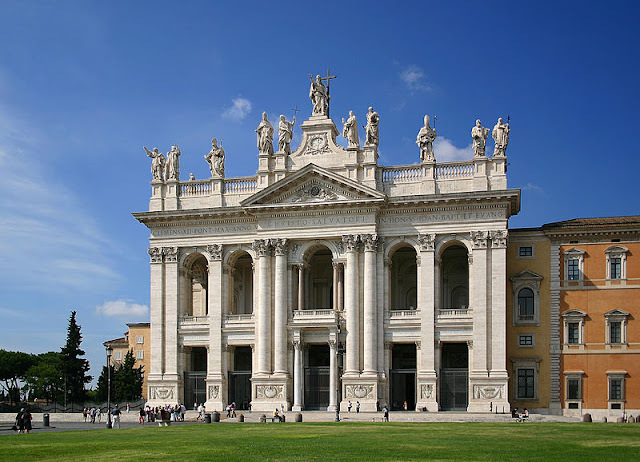 My next trip to Rome is only a matter of time and thanks to this article, I'm putting the San Giovanni de Laterano on top of my "to do list" as well as the Scala Santa (which this atheist never heard of before *blushes*). Hello Zabreena. I too find myself visiting my site and journals when bitten by the travel bug which is almost a daily occurrence at this point in time. I really need to get back to Europe ASAP. I am thrilled that you found San Giovanni and Scala Santa as fascinating as I did. Just wait until you visit the latter, despite your atheist beliefs, you'll still find it very moving! Thank you for stopping by to share your excitement...I love to read comments like this! You have a wonderful blog. Beautiful photos...San Giovanni in Laterano è uno dei miei chiese preferite di Roma. Greetings my friend and thank you so much for stopping by to share your kind compliments and thoughts! And I agree with you 100% that San Giovanni is of my favorites in Rome too!! Amazing pictures! I've found that my camera batteries love to go out when I need them most. Lol! I enjoyed the article and learned something new-which is definitely a plus. Can't wait to visit these places for myself! Hi there Michaela and thank you so much for your kind words. As you read, I have had plenty of other battery problems along my journeys..so I know how you feel. Here's to solid and full-charged batteries on all of our future journeys! Gorgeous photos as always! There is never enough time in Rome. So much to see and do around every corner. Next time I need to do this! Thanks so much for your compliments my friend!! I know, I need a week in Rome at least, to see it all and taste it too! ; ) Thx so much for stopping by to share your thoughts and make sure you put these places on your itinerary...they are not overrun with tourists and are particularly moving as you will find out! Thx again! Great photos...I think the most overlooked of the three is the statue of Moses in the Basilica of St. Peter in Chains. This ought to be on everyone's list, but as we all know, there is just so much to see in Rome. Hi there Gloria and thank you very much for stopping by and sharing your thoughts. I couldn't agree with you more! When I made out my list of all these places to visit before I left Rome on my 2nd visit, St. Peter in Chains was at the top of the list! Had to see this exquisite Michelangelo masterpiece!